Moving can be a very exciting adventure, but it’s not without its challenges. There are so many details to think about and keep track of before the packing even begins, like house hunting. Finding the right new home can be a little overwhelming, but with a little time and organization you can overcome the overwhelm and focus on the fun of it. 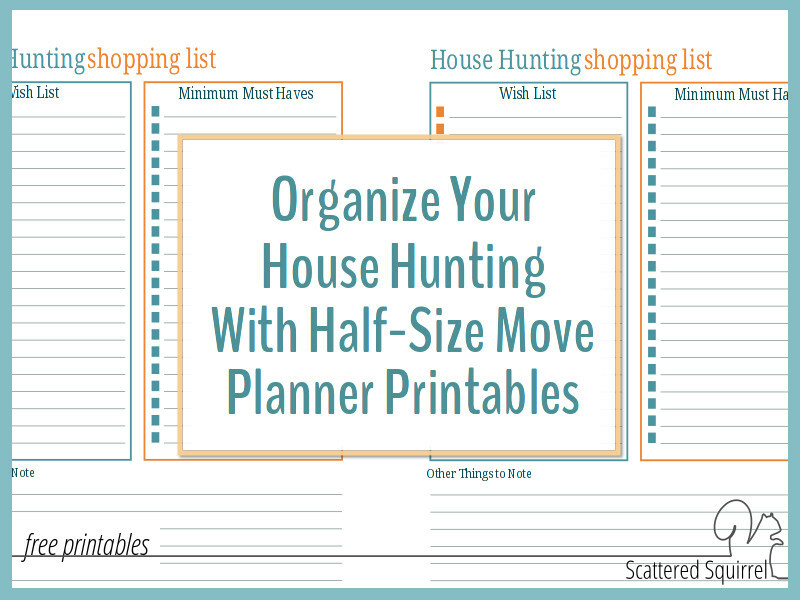 These half-size move planner printables are a great place to start organizing your house hunt. Regardless of your reasons, once the decision to move has been made there are certain things that need happen. One of the more crucial steps is finding your new home. As fun as shopping for a new home can be, it can also be really stressful. Which is why I created some move planner printables to help making house hunting a little more organized and little less stressful. A list of things you need in a home. A list of things you want in a home. Ok, so maybe it’s two lists. Which is why, the first printable in today’s post is the shopping list. 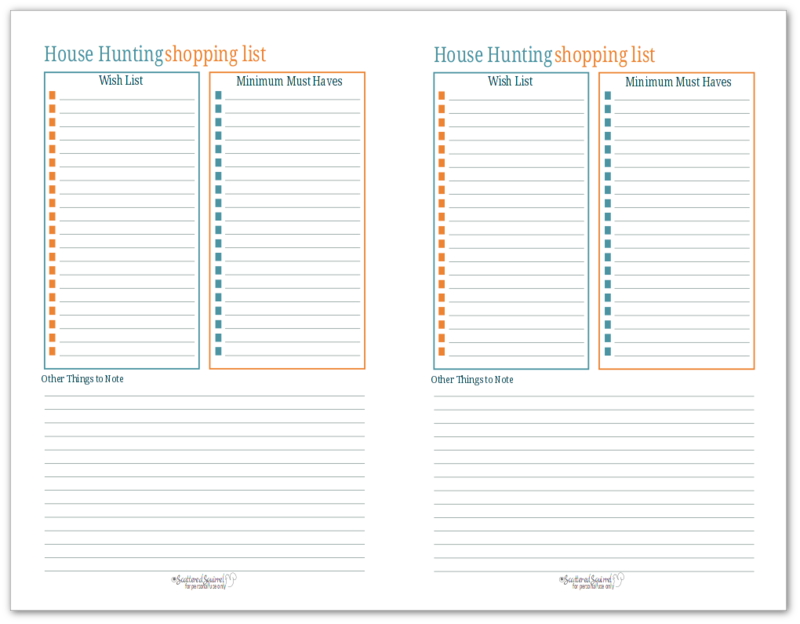 The first thing you might notice is that there are two shopping list pages on the printable. I like making sure we have a couple of copies of our shopping list. That way I have one and my husband has one. There is room for your wish list – all the things you’d love to have in a new home. Then there is also room for you Minimum Must Haves or your non-negotiable. These are things like number of bedrooms or bathrooms, schools in the area, basically, the items you’re not willing to live without. Having everything listed out by priorities can really help you narrow your focus. Finally, there is room for other notes. You might want to include reminders here, like checking out the commute time. Or maybe you want a reminder that being close to a school is something you need to keep in mind. If you would like the full size version click to here to go to it. Next up is the Home Evaluation worksheet. This planner was incredibly helpful for us when we were looking at moving a few years ago. It really helped to get our initial thoughts down on paper. When you’re looking at house after house, they all tend to blur together after a while. Having a form to check things off and rate the homes made it so much easier to weed out ones that just wouldn’t work for us. I made sure to include a space for basic specs and a space to make notes about what we liked and thought about the house. There are always so many details that can vary from house to house, so I included a space for other things that might be considerations when it comes down to making the final choice. Things like commuting time and additional fees can sometimes sway our decisions one way or another. 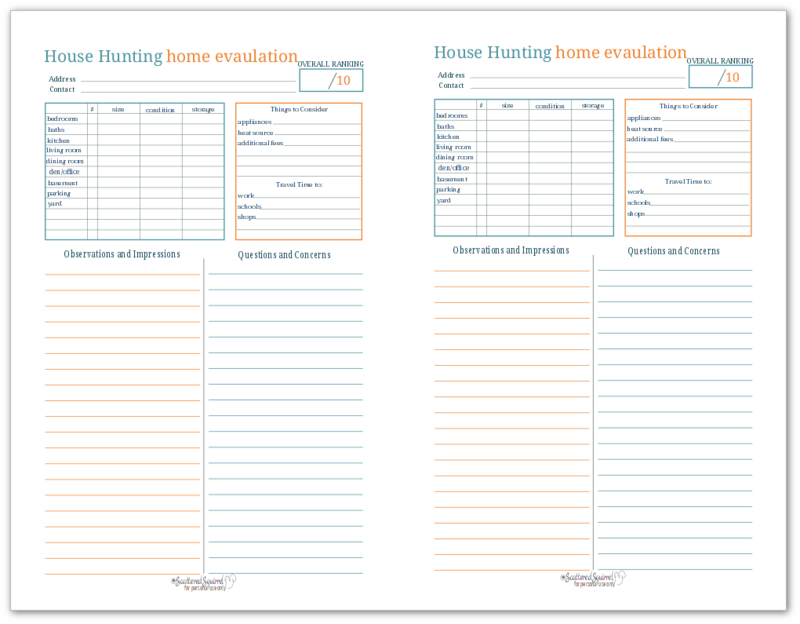 Having a sheet like these for each house you look for can help you keep your thoughts and observations organized so that making your final decision is a little easier. 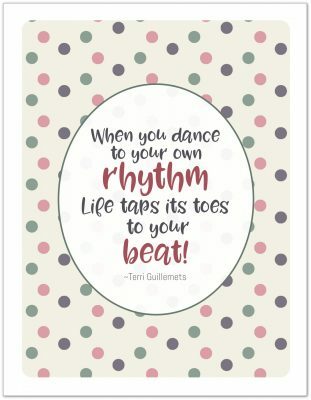 Click here to get the full size version of this printable. Being able to organize all the information for your house hunt is important but it’s not the only thing you can start organizing at the start of your move. Taking time to figure out your budget and to start collecting quotes is also a great way to make a move a little easier. This budget worksheet gives you plenty of room to start collecting financial information that you need to think about when moving. Items such as moving trucks or companies, deposits, packing supplies, even utility hookup fees. Keeping your financial stuff together can help you decide where to save and where to splurge when it comes time to move. If you would like the full-size version of this printable, click here. 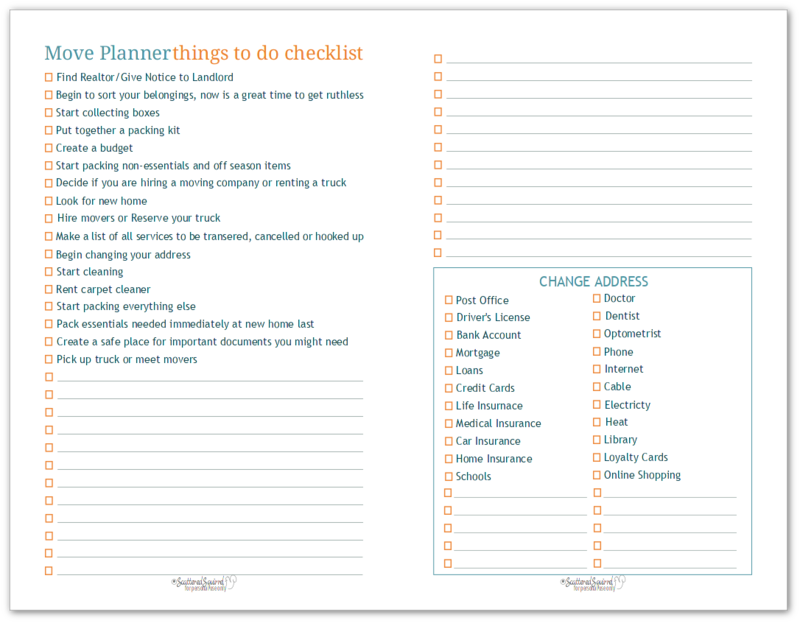 There might not be too much you can do right away, but having a copy of this checklist on hand can’t hurt. It will bring you a little bit of peace of mind knowing that you have a place to keep track of everything you need to do. As time goes on, there will be more and more things you need to do to get ready for your move. Using this checklist you’ll be able to see at a quick glance what you’ve already done and what still needs your attention. To grab the full-size copy of those printable, click right here. Moving can be a very exciting adventure, but it can also be very stressful. Having a place to keep track of all your to-dos and other list can go a long way towards alleviating some of that stress. 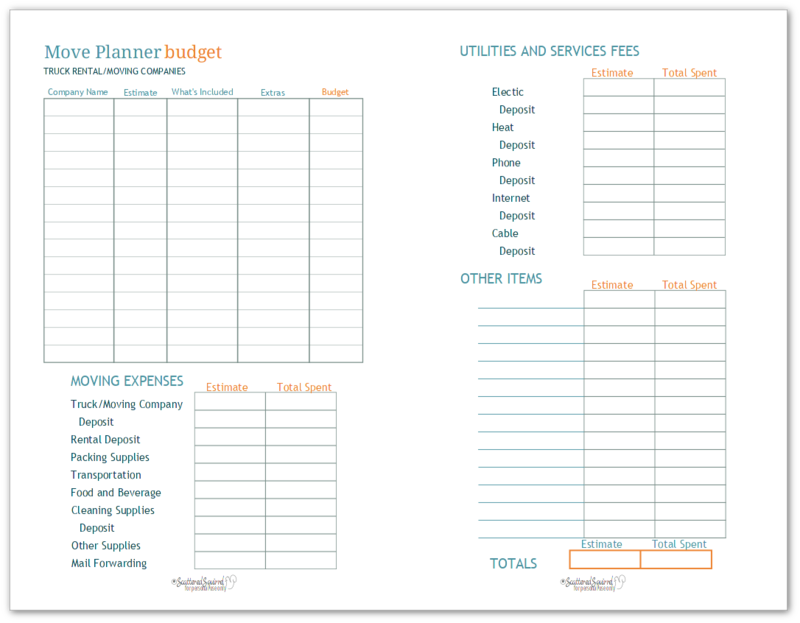 It’s my hope that these half-size move planner printables will come in helpful for you when you plan your next move. Whether you create a separate binder/planner for your move; make a section in your planner to keep it all in; use a note book or file folder to collect and keep the information together – having a system in place will make moving a lot easier. Are you planning a move? Do you use a system to help you stay organized during it all? Do you have any tips for making house hunting or moving easier? Chime in down in the comments below and share if you’d like to.